Dear Santa...... Don't you love my stockings that I have stamped and colored using my SinCity Christmas Stamp Set. I began by layering green and brown card stock that I distress using my Tim Holtz distress tool and placing them on a white card base using my Xyron Tape Runner. Stamp and color three sets of stockings using your favorite markers...I used Copic Markers. 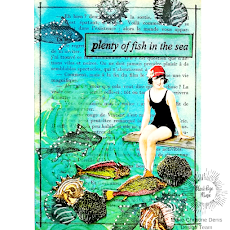 Once colored...fussy cut and layer them together using pop dots and place on card front using your Xyron Tape Runner. Another adorable Christmas card, Pam. I love how the stocking look like they are hanging from the lines on the paper. Too cooooool! Your stamps are fabulous!! !